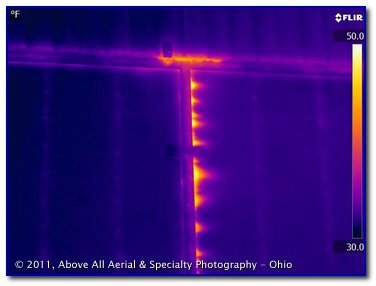 Infrared building surveys are a great tool for energy conservation purposes. A quick and affordable infrared scan of a building or home can reveal insulation defects, air leakage, and moisture infiltration - all of which result in wasted energy (and wasted money!). The energy cost savings realized by repairing the deficiencies that we find will more than pay for the cost of our service. Infrared images serve as quality to control to ensure insulation has been installed correctly. 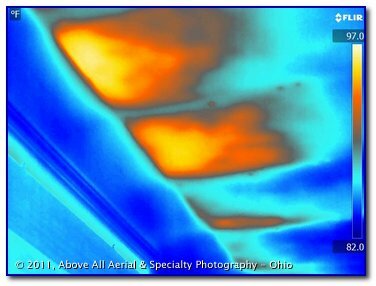 Thermographic scans of roofs can often detect roof leaks. Quote: "In addition to using thermography during an energy assessment, you should have a scan done before purchasing a house; even new houses can have defects in their thermal envelopes." Quote: "A thermographic scan performed by a certified technician is usually accurate enough to use as documentation in court proceedings." 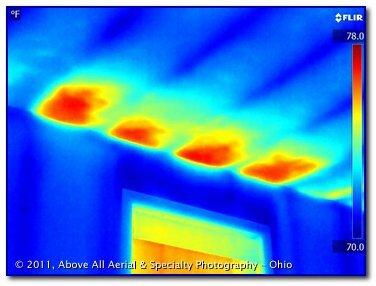 Above All - Ohio can perform a quick qualitative infrared inspection of your house, office, or business to find these defects. This cost-effective scan can reveal both minor and major problems that may otherwise go undetected by a traditional inspection. When acquired properly, infrared images will clearly show areas of heating and cooling loss (air infiltration...). Knowing the location and scope of these problems will allow repairs to be made quickly and efficiently. In addition to being environmentally responsible, correcting infiltration issues can save you a lot of money over time. Infrared scans are completely passive, non-contact, non-destructive, and affordable. 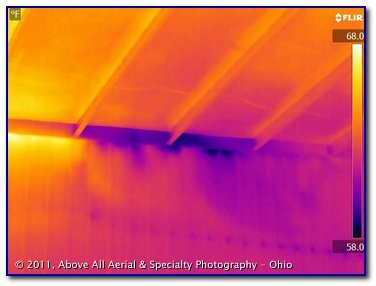 Order an infrared inspection before making an investment (as a buyer), before accepting a listing (as a real estate professional), before insuring any property (as an insurance company), or to find energy-wasting problem areas in your own home or business! 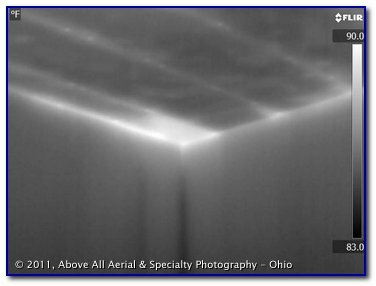 Infrared image indicates water trapped above a metal ceiling liner panel. An insulation deficiency results in air inflitration. Defective or worn out door seals allow air inflitration. 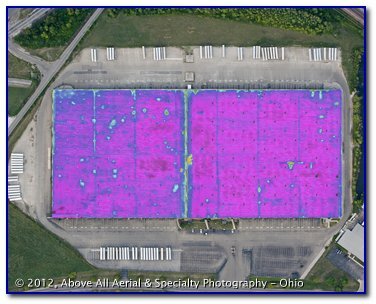 An aerial scan is almost always more cost effective than a traditional on-roof scan. This is especially true when there are multiple roofs and/or multiple levels of roofs to be inspected. 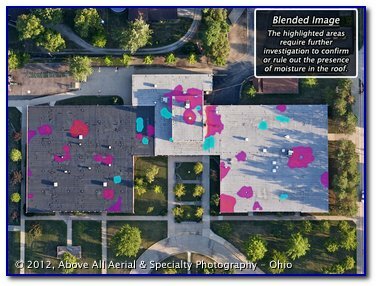 Visible and infrared aerial images can be blended together to clearly identify and locate areas of concern on your building's flat roof. Insufficient attic insulation allows heat into living space. 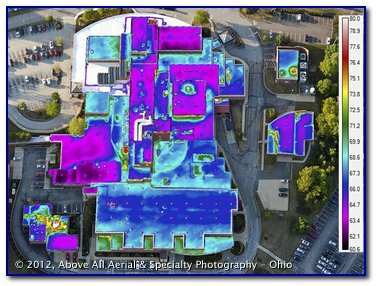 An aerial infrared roof scan reveals areas where moisture is trapped in a flat, membrane-type roof. This image has been thermally tuned to highlight areas that are more likely to contain trapped moisture vs. areas where temperature differences were observed, but may not necessarily be due to trapped moisture. An aerial infrared roof scan of a built up roof ("BUR"). The left side of the this building has far more areas of concern than the right side. The distinct dividing line in this image is NOT due to the presence of moisture. 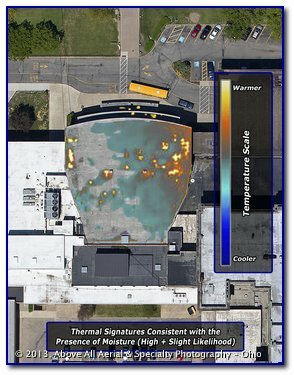 A qualitative inspection of a building is one that merely looks for differences in the apparent temperature of surfaces. This type of building inspection is very fast and therefore very affordable. A more time-consuming quantitative inspection can record actual temperatures with great precision. 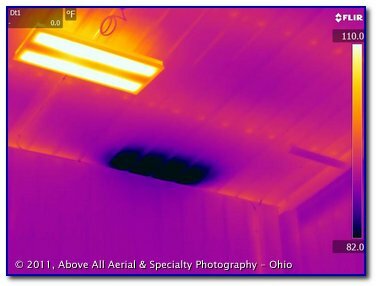 Above All - Ohio utilizes a very high-tech infrared camera capable of both types of inspections. However, in building applications, a qualitative inspection almost always shows us what we need to see in order to identify potential problems.